I have become a poster spotting obsessive. There is a serious risk of injury as I walk around Brighton examining not just each and every house but each and every pane of glass in each and every window. I’m looking for election posters. I may yet miss pot holes and dog turds. If you spot me wandering around, be sure to holler. I won’t see you first. I’m concentrating. Who’s winning this poster war then? Maybe the Greens right now. Maybe. But Labour’s doing ok too. I’m doing my bit. Let me tell you: my house plants won’t see May 7th because they’ll be dead. 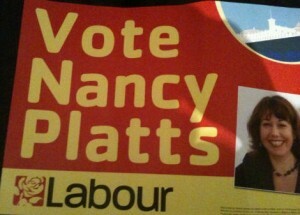 I fear no natural light can penetrate the full array of Nancy posters in my front windows. In the last few days I’ve been out and about a fair bit in Brighton Pavilion, on work and politics, in Hanover, Regency and the St Peter’s and North Laine wards and there are some Green posters and some Labour ones too. That’s to be expected: these areas are the Greens’ heartlands and well within that crunchy, healthy, roughage-rich and all-important muesli belt. There’s only one thing I can say with any certainty. I haven’t seen a single Tory poster yet. Not one. Anywhere. Maybe there are some up country in the wilds of Withdean. I don’t go to Withdean much. Posters. I wonder if they matter? I think they probably do. But I think they matter more to the Greens. They need to be credible and have a show of support. Those garish green posters normalise Green support. Labour needs to win the poster war too. Posters say “we can win”. It’s still early days, but I think it is striking that there are so few posters out there are so far. It’s not like 1997 yet: we painted the town red. I’ll be keeping an eye out! I can report that the Lib Dems appear to be winning the poster war in Highbury, although perhaps only because theirs appear to be (quite literally) four times the size of ours. I too have your problem! i feel like i’m going to run into some cars as ride around on my bike watching for posters! But i have to disagree that Labour have very many posters up. i rekon there are probably around 10 Green houses with posters for every labour poster where i have seen. Juat walk along Upper Lewes Road, there are loads of Green Posters!